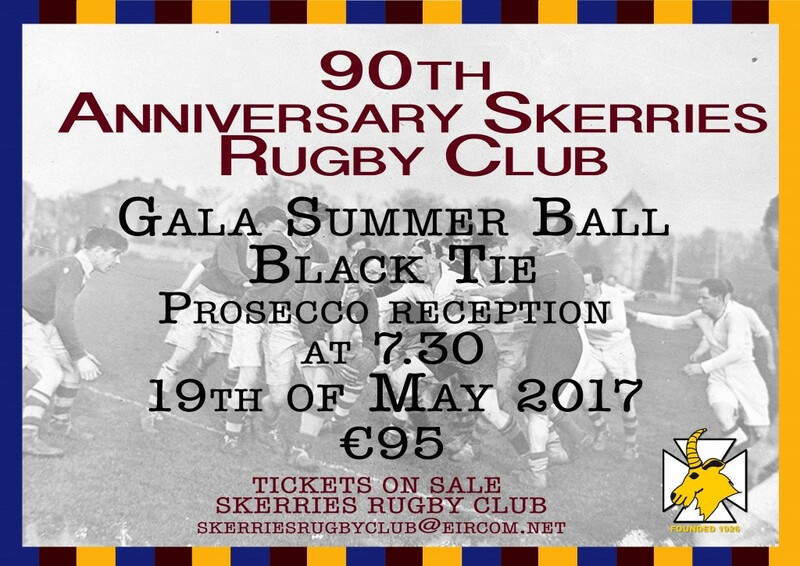 Skerries Rugby Club celebrates it’s 90th Anniversary in 2017. To commemorate this very special year we are having a ”Black Tie Gala Summer Ball on the 19th May”. Luxury Marquee on the grounds of the Club for the night. Prosecco reception on arrival at 7.30pm. A gourmet three course meal & cheese board catered by Conor Mc Gloughlin. 150 Tombola prizes to be won. Buy a ticket win a prize ! Raffle prizes of kit donated by three international players. For our auction two premium tickets to a home Six Nations Game, chauffeur driven to the match with an overnight stay in the team hotel with dinner for two. “Risky Business” will be providing the entertainment on the night with the clubs own DJ Clyde after. This will be an event not to be missed so get your buddies together for a great night. Over 30 tables sold already so don’t delay. Tickets €95 available at Skerries Rugby Club. Tickets must be paid in advance by April 16th Easter Sunday. Dorian Black have special rates for black tie hire for the night.